The full course is 40 minutes long and available in a number of affordable formats. 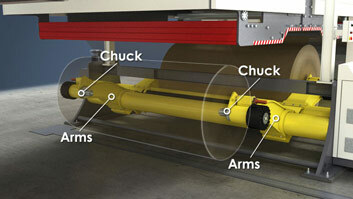 In the two-roll flexographic printing system, ink is piped to the nip between the metering roll and the anilox roll. 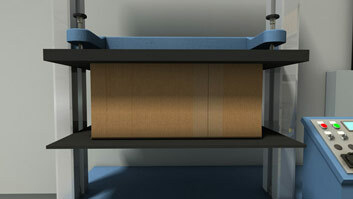 The gap between the two rolls determines the amount of ink that is transferred to the printing plates. The scorer-slotter scores, slots, trims, forms the glue tab, and crushes the box ends to prepare them for the manufacturer's joint. The glue lap unit applies adhesive to the glue lap, the panel to which it will be adhered, or both. 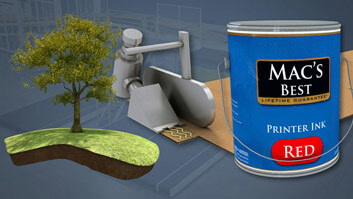 The adhesive can be applied by a wheel, spray system, or extrusion system. This course describes the design and operation of the machine sections that make up a flexo folder-gluer, including the feed section, printing section, creaser-slotter, die cutter, glue lap unit, folding section, and delivery end. This customer provided only a star rating and no written review. 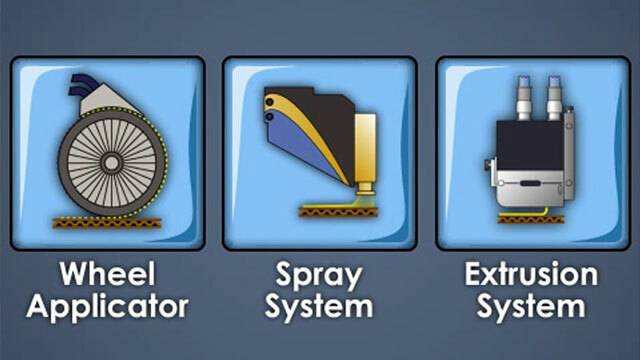 In what order does a flexo folder-gluer perform its operations? 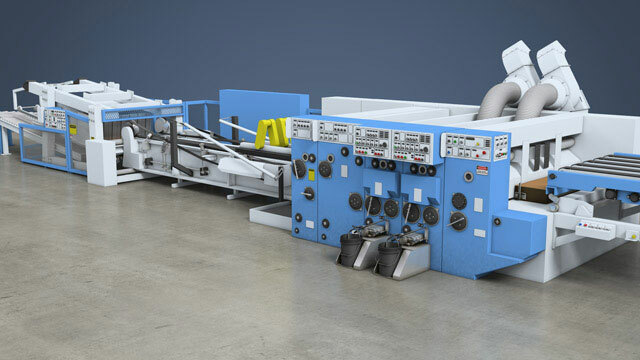 Typically, a flexo folder-gluer performs its functions in the following order: blanks are fed one at a time; printed with one or more ink colors; scored, slotted and trimmed; glued and folded; and counted and stacked. 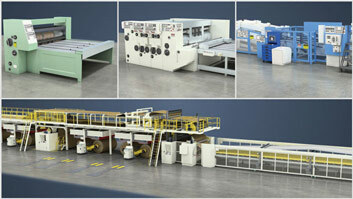 How are the sheets of corrugated board fed one at a time into a flexo folder-gluer? Blanks can either be pushed or pulled into a flexo folder-gluer using a kicker-type feeder, a suction-type feeder, or a combination. 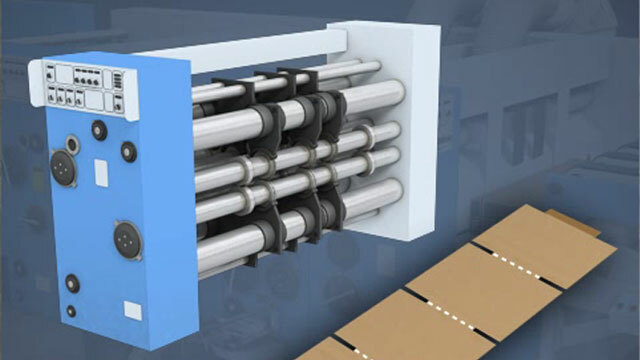 Feed (or pull) rolls accelerate each blank as it enters the machine to create the required spacing between the blanks. When more than one color is to be printed, how is the order of application determined? Because the inks are somewhat transparent and the printed surface becomes less and less absorptive, darker colors are usually printed first and lightest colors last. Why is it important to continuously agitate flexographic inks, even during short down times? Flexographic inks tend to thicken as they are agitated until they reach a stable viscosity. Continuous agitation maintains their viscosity and and also avoids drying of the inks in the pans and circulating systems. How can adjustments and maintenance be performed on the different sections of a flexo folder-gluer? Rollout and rollaway models allow for easier access to the sections. 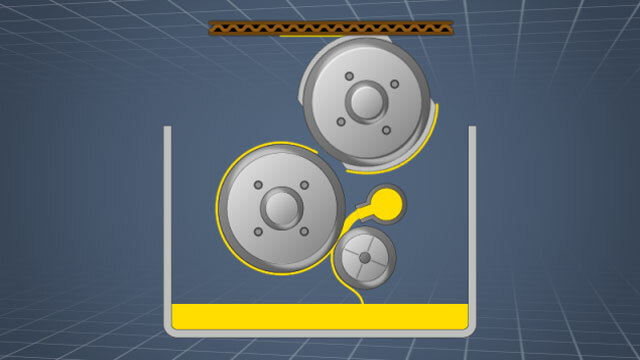 In rollout machines, the printing and die cutting sections can be rolled out to the side, while in rollaway machines, the sections are mounted on rails and remain inline when they are separated. Although different equipment manufacturers have slightly different designs, the same basic operations occur in all flexo folder gluers. The blanks are scored across the flutes at the corrugator. Before they reach the flexo folder gluer, these scores help create the box flaps. 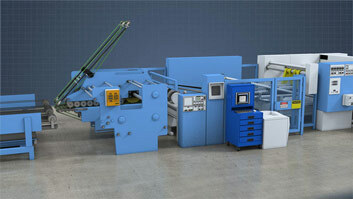 Then, at the flexo folder gluer, the blanks are fed into the machine one at a time at the feed section. From the feed section, the box blanks travel to the printing section, where they are printed. Next, at the scorer slotter, each blank is scored in the flute direction and slots are cut to complete the box flaps. The glue tab for the manufacturer's joint is also cut and any additional trimming takes place. Finally, the manufacturer's joint is glued, the blank is folded, and then the boxes are counted, inspected, stacked, and prepared for shipment. The box blanks are shipped to the customer in their knocked-down or flattened state in order to save space.